If you live in a thirty-mile radius of New York City and listen to the more popular smooth jazz stations you have heard track ten, Jealousy, the title of the CD. 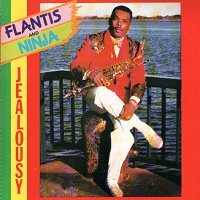 The haunting saxophone lead and the evocative vocals are the first release of Flantis and GT Ninja. On the CD you get two more renditions of Jealousy: tracks eleven and twelve. The latter is an uncharacteristic urban mix in which the diction is such that one understands every word one hears. Even if you're alien to hip hop you can enjoy that version too. In an unintended way, it exemplifies the CD. The arrangement is polished, the voices are understated and in harmony with the saxophone, the background vocals and other accompaniment. All the other tracks have this quality.